Director Kappos has been on the road recently setting the groundwork for the USPTO’s new offices slated to open in Dallas, Denver and Silicon Valley. He’s also planning visits to other communities to speak on the importance of innovation in our economy, such as at an October session at the University of California-Davis. He’s also planning to speak about the importance of leveraging IP to identify economic solutions in the 21st century at the coming World Economic Forum. Atlanta Mayor Kasim Reed, Invest Atlanta President and CEO Brian McGowan, and Georgia Tech President G.P. 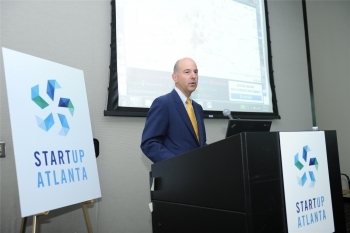 “Bud” Peterson were all present to promote the Startup Atlanta initiative.